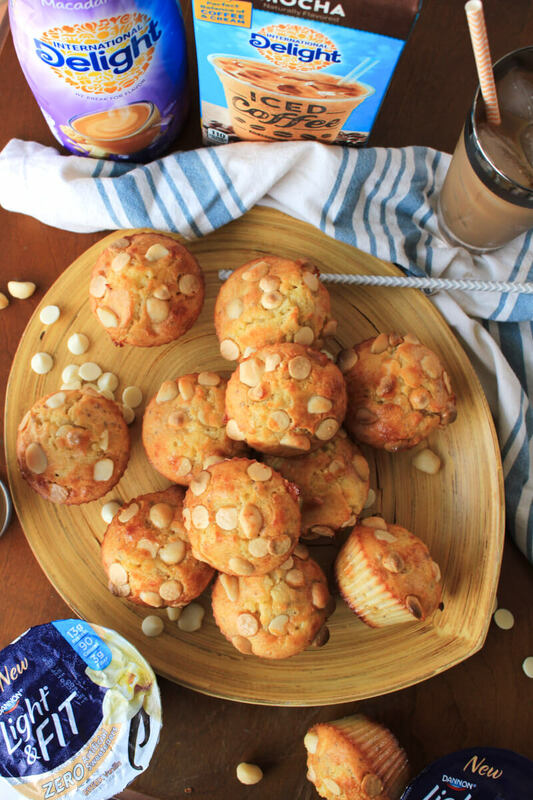 White Chocolate Macadamia Nut Muffins are the perfect grab and go breakfast or snack. Pair with a glass of iced coffee and some Greek yogurt for a protein-packed treat that will boost your morning mood and re-energize your day! My kids are early risers. It wasn't until very recently that my 8-year-old began sleeping in even a little bit. In all honesty, I'm lucky if she might make it until 9:00am on the weekends. My little guy, on the other hand? Well, he believes that if he sees one tiny sliver of sun coming through his blinds, that means it's get- up time. Throw daylight savings into the mix and we have more way-too-early mornings than I'd prefer! On a normal weekday, by the time I get the kiddos off to school, I am ready for my mid-morning pick me up. Between, the kids waking up at the crack of dawn, the dog walking, the shoelace tying, the packing lunches, and the general chaos of our mornings, this momma needs her coffee! Mid-morning, when I come home to a quiet house, is when I'd like to be curling up in bed for a little cat nap, but instead, I try to take advantage of the three hours I have to myself to get things done around the house and on the blog. What better way to energize my morning than an iced coffee and a protein-packed breakfast, right?! I'm not huge into cooking breakfast for myself, truth be told. I've spent the majority of my life not eating breakfast at all. But as I've grown older and wiser, I've learned that fueling my body makes a more focused, happier me. 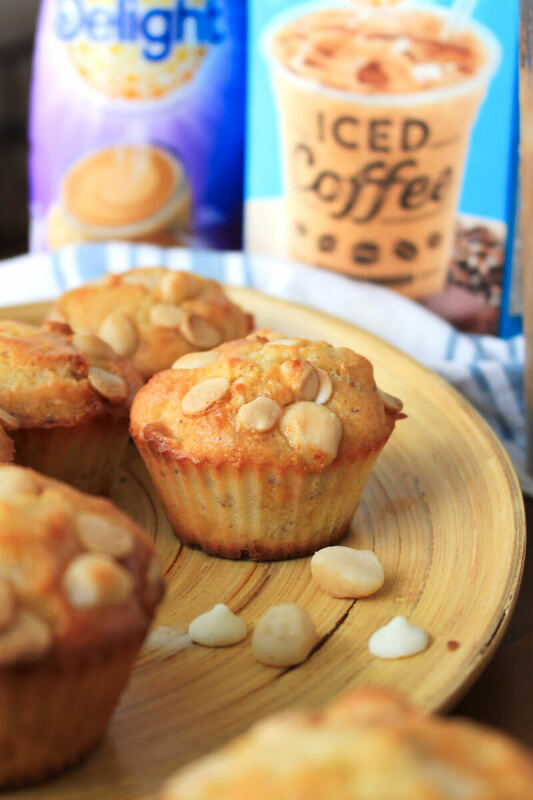 That's why I like to keep it simple and set myself up for success with creative recipes like these White Chocolate Macadamia Nut Muffins made with International Delight White Chocolate Macadamia Creamer and Dannon Light & Fit Greek Yogurt made with Zero Artificial Sweeteners. Yep, there's coffee creamer and yogurt in these little muffins! I'm sure you're familiar with International Delight Coffee Creamer, right? International Delight has been synonymous with exceptional creamer since 1987! 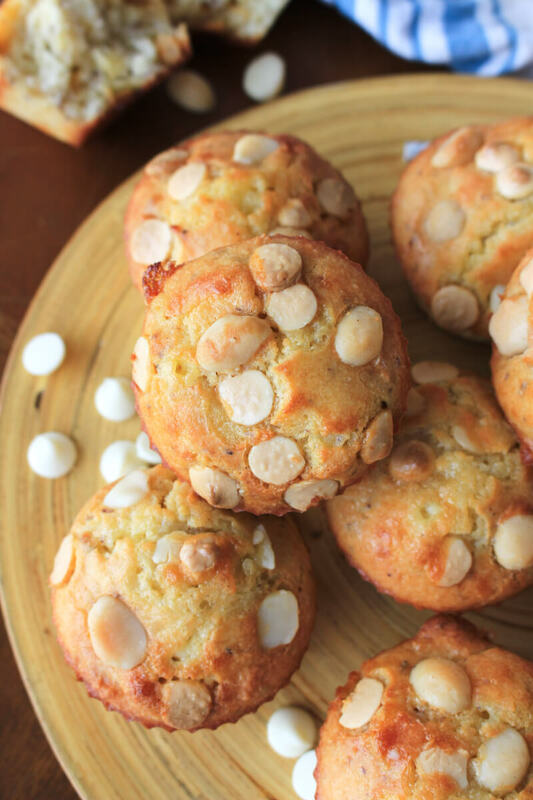 My absolute favorite flavor is the White Chocolate Macadamia, which is what inspired these muffins. 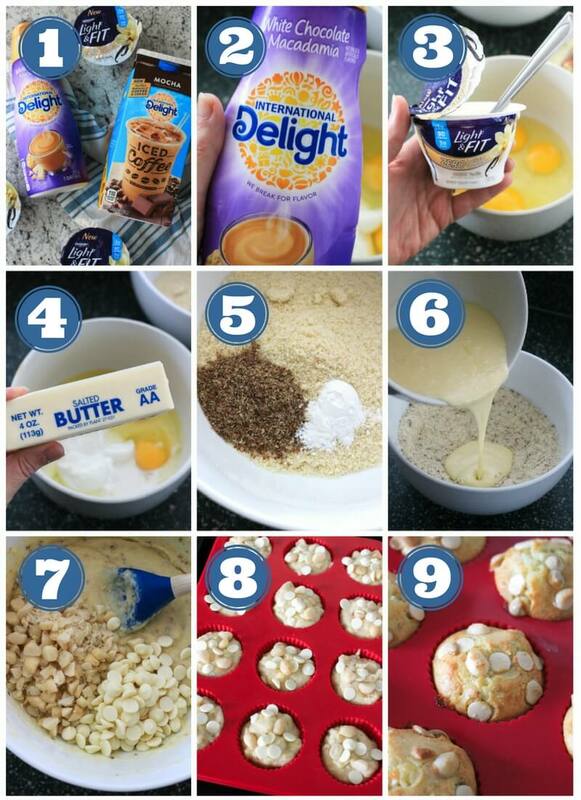 Now, normally you would use a creamer in your morning cup, but I decided to think outside the box and incorporate creamer into a muffin. 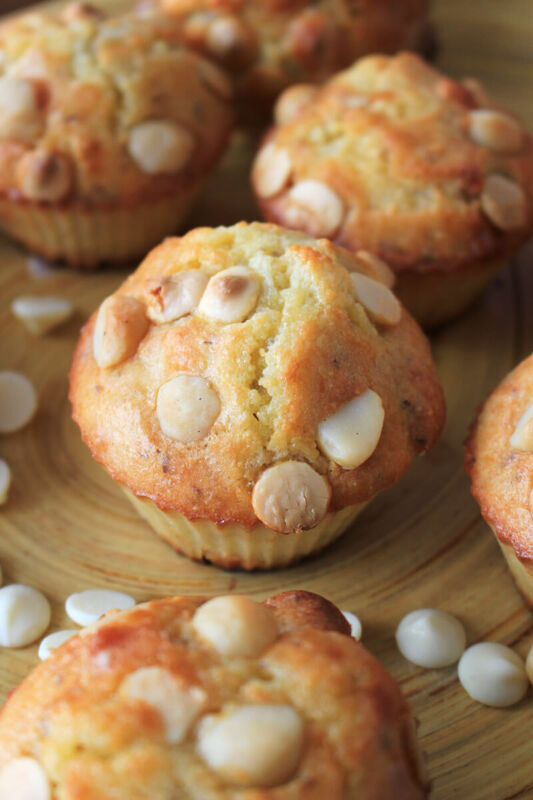 White chocolate and macadamia is a match made in heaven if you ask me, and I knew that if I incorporated those flavors into a convenient, ready-to-eat breakfast muffin, I would be much less likely to skip the most important meal of the day. These muffins have it all! They are deliciously nutty thanks to the almond flour base and chopped macadamia nuts. They have flaxseed meal added in for an extra boost protein, fiber, and omega-3 fatty acids. They have Dannon® Light & Fit® Greek with Yogurt with Zero Artificial Sweeteners mixed right into the batter which makes them super moist. They are lightly sweetened with International Delight Coffee Creamer and white chocolate chips. Yum! Paired with International Delight Iced Coffee and a cup of Dannon® Light & Fit® Greek with Yogurt and I have a complete breakfast that gives me the boost of energy I need to get my day moving in the right (and productive!) direction. 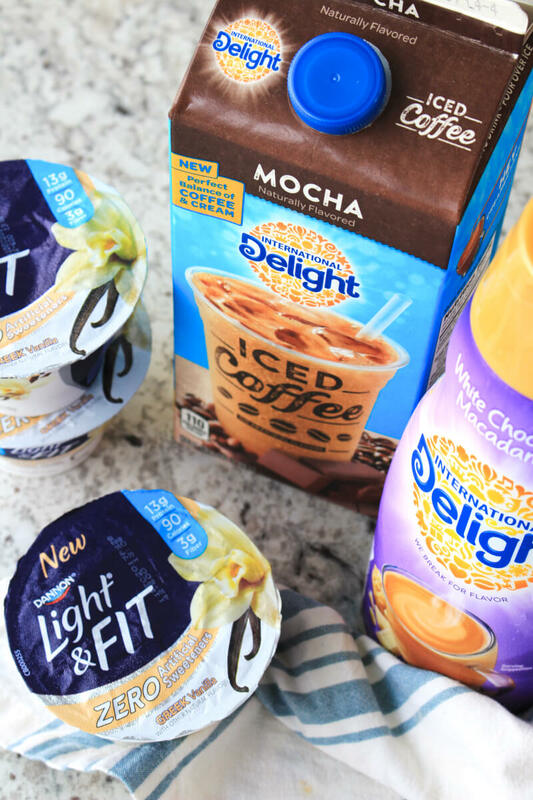 I've always been an iced coffee fan and I have to say, I am so in love with the International Delight Mocha Light Iced Coffee. It is perfect for me because it's ready when I am. All you have to do is pour over ice and you're good to go. It has the perfect balance of coffee and cream, is made with 100% Premium Arabica Coffee and contains zero corn syrup. The mocha flavor is rich and delicious and I can't get enough of it! The Dannon® Light & Fit® Greek Yogurt with Zero Artificial Sweeteners is the perfect way to round out my mid-morning pick me up. It's non-fat, creamy, smooth and adds to that punch of protein I'm looking for to get my day going. 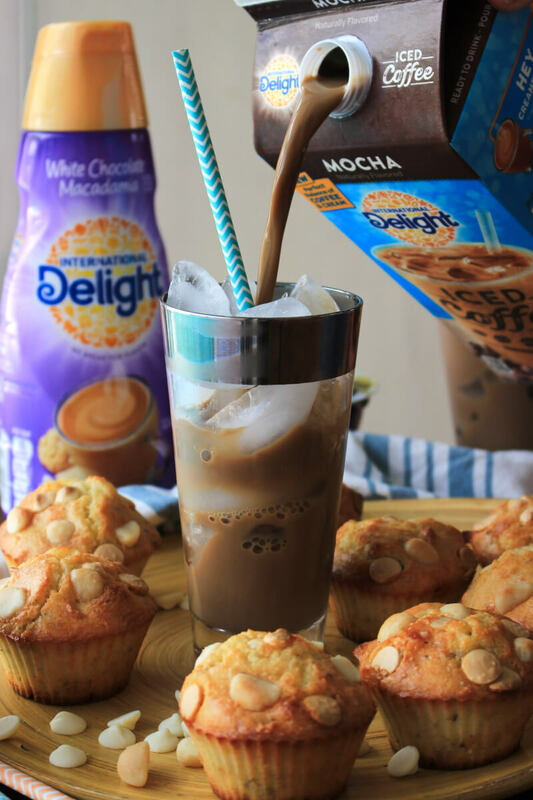 Whether you're a mom like me who is trying to make the most of her precious time alone or you're at work and in desperate need of a pick me up, you should give these muffins, yogurt, and iced coffee a go! I'm willing to bet you'll love them just as much as I do. Dannon snacks and drinks are the perfect energizers to get you from “yawn” to “game on!” Pick up your Dannon goodies at Publix today! 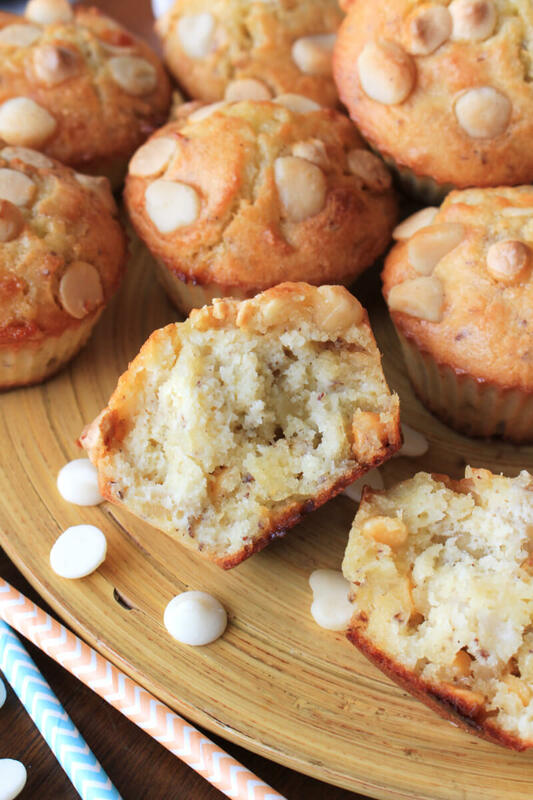 White Chocolate Macadamia Nut Muffins are the perfect grab and go breakfast or snack. Pair with a glass of iced coffee for a protein-packed treat that will boost your morning mood and re-energize your day! 1. Line 12 large muffin cups with muffin tin liners or use a silicone muffin pan. Preheat the oven to 350 degrees F.
2. In a large bowl, mix together the almond flour, flaxseed, and baking powder. In another bowl, mix together the eggs, melted butter, International Delight White Chocolate Macadamia Coffee Creamer, Dannon® Light & Fit® Greek with Yogurt, and vanilla extract. 3. Add the wet ingredients to the dry ingredients and mix until just combined. Fold in the white chocolate chips and macadamia nuts. 4. Divide the mixture between the 12 muffin cups. Top with additional white chocolate chips and macadamia nuts, if desired. Bake for 25 minutes or until they are golden brown and set in the middle. Leave in the pan on a cooling rack for 5 minutes before turning out of the pan. I'm obsessed with Lite & Fit yogurt. The vanilla seriously tastes like dessert! I will have to give this recipe a try.